I will use this for when I do freelance graphic design work! The pen feature would be great to have. I will also use this with both kids, to help them learn how to use a computer. Already a subscriber. Would use this whenever I’m on the bus or any passenger seat. I am an e-mail newsletter subscriber. I would do so many different things. First, I run my own home business and my laptop quite working three years ago. After my fiance was laid off, purchasing a new laptop was last on our list. I am trying to build my home business so I can stay home full time. I would love to have a reliable laptop that I can bring with me to clients so I can answer their questions and do invoicing in front of them. I am currently having to go home look up answers on my home computer and calling them back alter that day. Not great business tactics! I am also going back to school in the Fall for a degree in journalism and marketing. I love to cook and would find this VERY useful in the kitchen. I am the type of cook that has to go by a recipe to feel comfortable, so having access to the recipe would be great without having to print it or run to the office every few steps. I also do a lot of photography and would love to be able to organize and share my photo’s with some great programs available. Thanks so much for a a great giveaway! i am a subscriber. i would keep it and give my current one to my teenager! I would use it for school work for graphic design using the stylus and for creating other media. I would also use it to watch DVDs during downtime between school, work, and home life. I subscribe. I’d replace my tired old pc with this wonderful TouchSmart notebook. I’m developing some fairyland stencils for the kids’ rooms. This would make it so much easier a job. I subscribed as required. I would like to give this to my son, he’s a wiz at computer affairs and would emjoy this and if he lets me borrow it(which he would if I’d win it for him) I would love it for my Greeting card design making. I want to win one for my girlfriend. This is my first mothers day and although I’m not a grad yet I’d love to have one of these for when I return to school next fall! It sure would help a ton! ebook feature to read on the road ty. I’m a subscriber and I would use the HP on my travels. It would be great to watch a video on the plane with my hubby. The swivel screen would make that so easy! There are way too many to choose! Would love it for the long trips and to keep my daughter entertained. I would use it for everything! We did have a portable dvd player, but it just doesn’t work after years of using it, and my old laptop’s monitor went out, so I have to hook it up to a desktop monitor and I can’t move it around. I have 4 kids who I would have to share it with. I can see this getting used, alot! 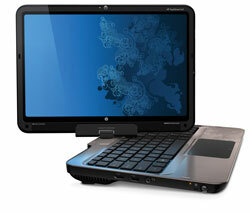 I would use the HP TouchSmart for school assignments and my artwork. I would give it to my Mom, she really wants a laptop but is very intimidated by computers. The touchscreen would be good for her. I would tweet my business to the world of course. Seriously I would take this baby everywhere and get my ideas down when I had them instead of saying oh I’ll do that when I get home which there are always thousands of other things that need to be done. It seems I am forever taking someone somewhere or going with them and there is a lot of downtime and I could blog, write and just generally keep in touch. I would also LOVE LOVE LOVE using it as an e-reader! This looks soooo awesome! I would definately keep it for myself!! I’m a subscriber. I’d have to take this to work when I work my 12 hour overnight shifts. It would keep my entertained for awhile. I would better organize my life with a pc like this. Kids going in every which direction and running 2 businesses is not easy! First of all I am a suscriber and a huge fan of Techlicious. If I won and I deeply hope I do, I would use the HP Touchsmart to create detailed artworks with Corel Paint It!, which is already preloaded on it, and the fantastic touchscreen. I would share the laptop with my mother who is a great cook and comes up with and publicly shares her delicious recipes. In addition I would use it for my education purpose especially that I am going to college in the fall. I will definitely use it to research various careers and help succeed in my studies. I know its hard to win but I would sincerely need this piece of equipment to help my family and I do good things. I am starting college in the fall and I would need this touchsmart laptop to create artworks with the Corel Paint It! Moreover, I would need it to research and make papers for college. Hope I win since I need a computer to successfully complete my double major educational career. I would give it to my wife as a belated “Mother’s Day” present. She needs it to replace her “creepy crawler” laptop she’s now using. I would love to use then when I travel, it would help me on the road. subscribe&would; love it, starting back at school in the fall&this; would help a lot! I would use this for school. I haven’t had a laptop since mine broke in December and REALLY need one. I am visually impaired and it would be nice to have a device large enough to see. This versatile HP TouchSmart would make my life easier, I could get my recipes, shop, and keep in contact with my friends and family much quicker and maybe learn to add my videos. I am a subscriber, I would like to twitter, blog, actually use my computer to do wonderful things with my children’s pictures, shop, write a book and explore the world. My computer is an old Windows 95 that keeps freezing so I get frustrated and walk away from it. Please pick me! I would be cooking up a storm with all the receipes I could get so easily from my new HP Touchsmart. Thanks!!! I would use HP TouchSmart to watch movies on, we have a poor quality TV and this would be perfect to watch while laying in bed Cheers!! I am a subscriber. I would give this to my daughter who is a teacher. I am a subscriber. I would give this to my daughter, who is a teacher. Give it to my grand daughter so she can give it to her special needs friend….at school…..They are BEST Friends Forever BFF My grand daughter really welcomes the opportunity to help her. I love to travel and I love to blog. It would be well used. I would use this when I deploy. I am a Marine and this would be perfect to keep in touch with family. If I won I would give this my daughter who is useing out old desktop computer that is slooowwww. I would give it to my daughter. We have three teens and ONE computer. Nuff said. I’m a subscriber! I would love to take this on my travels. The swivel screen would be perfect for watching videos while on the plane! I would finally retire my hand-me-down laptop if I were to win this giveaway. I’m rocking an IBM Thinkpad that may be from the late 1990’s… All I know is that it’s big and barely functions. If I won this it would make my senior year of College more manageable. I’m working towards an Accounting degree and a new tablet would definitely make my life easier! I could take notes and keep them better organized! THat would be a lifesaver! I would do everything with it, including store my pictures and music and do all of my homework. I would use it to read the news. I am a subscriber. I’d give this to my oldest son if I won it. He’ll be graduating from college in a few weeks and this would be perfect for him. I love the fact that he’d be able to draw and save his artwork right to his computer. He’s always doodling and putting his creative ideas on paper. This would be a great way to keep everything in one place. Thank you so much! Have a beautiful day. I need a new computer and would love to be a winner! I will retweet and post on Facebook!